Of all the sites I researched for my thesis, this one offered the most challenges. It was the most difficult to research, the most difficult to access, and when we got there, the most difficult to map and photograph. It wasn’t helped by it being an overcast day and the GPS not able to find enough satellite data. Photo by Lisa M. Daly 2010. The site is located behind the airport, south-east of runway 2 (13/31 degrees or 12/30 during the war era, Tibbo 1997). It is on the edge of a large bog, and I tried to access it from a few different routes. In 2010, trying to take a direct path across the bog, I ended up falling in up to my chest and had a lot of difficulty getting out. I certainly didn’t want to risk my assistant falling in, especially seeing as up to my chest would have been over her head! A second attempt had us skirt the bog in an attempt to get to it that way. In this case, we came to a river. It was pretty fast-flowing, so not easy to just cross. So, one assistant attempted to make us a small bridge with some deadfall to make crossing easier. He fell in and got absolutely covered in river muck. It was a cold day, so I thought it best to try again later. Over the rest of 2010 we reached other sites and recorded those, and the B-25 found itself left for another year. The river that took out one of my assistants in a 2010 attempt to reach the site. Photo by Lisa M. Daly 2010. In 2011 I had a different team, and it was a much hotter July. So if we got wet, we’d dry relatively quickly and not have to worry about being wet and cold for hours while trying to work (have to put the health and safety of my team first, of course). It also helped that between 2010 and 2011, GoogleEarth had updated and had better images, so we found what looked to be an old, overgrown, road that should take us somewhat close to the site. Turns out, we couldn’t find a road, but there was a river that took us most of the way, so we hiked up our packs and portaged the survey equipment down the river. With a great team who weren’t afraid to get lost in the woods, we found the site. The edge of trees from the bog. 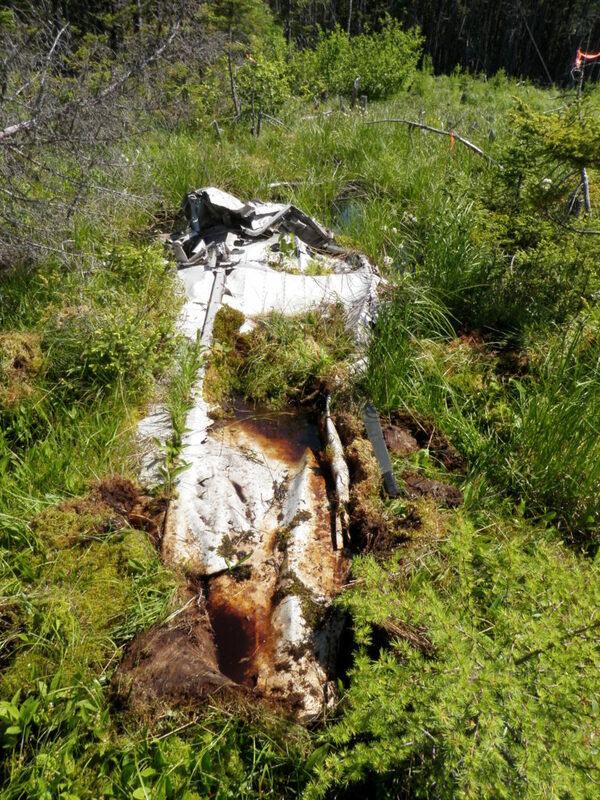 Aircraft debris was found in both the bog and the trees. Photo by Lisa M. Daly 2011. Royal Air Force records are not easy to come by. 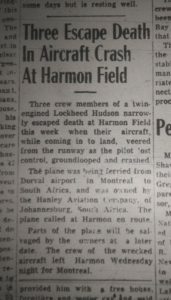 Many of the ones related to specific aircraft were destroyed, and the personnel records (how I found information about the Hudson near the Commonwealth War Graves) can only be accessed by the individual or a descendant. Some websites claim to have the records, but won’t show anything until you pay them. So, that leaves me with online forums and Ocean Bridge by Christie (1995). 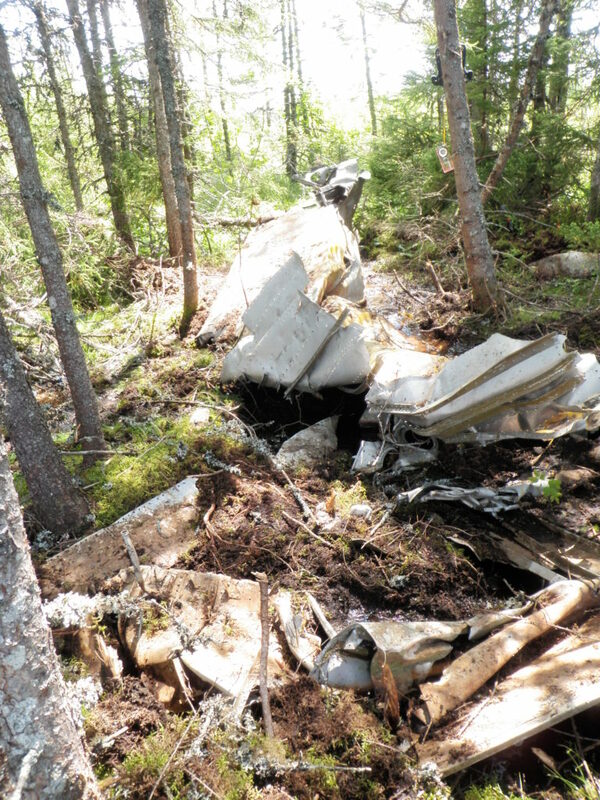 What is known is that RAF B-25 Mitchell KJ584 crashed during a night takeoff from Gander on 29 August 1944 at 0342 GMT (Christie 1995; RAF Forum 2012). All crew on board were killed in the crash. Aircraft debris. Note, the machete visible in these pictures is there for scale (we forgot our scale). Photo by Lisa M. Daly 2011. Crew of B-25 Mitchell KJ584, adapted from Christie (1995). Christie has Kabin listed as a Canadian civilian, but according to the RAF Forum and the NBG site, Kabin was RAF Transport Command, meaning he was a civilian who was ferrying aircraft overseas before the RAF took over. 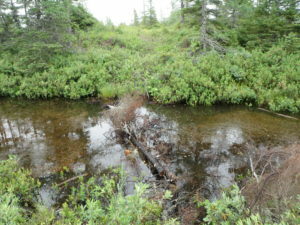 Debris found in the bog showed significant deterioration, possibly due to the rise and fall of the bog during wet and dry periods. Photo by Lisa M. Daly 2011. 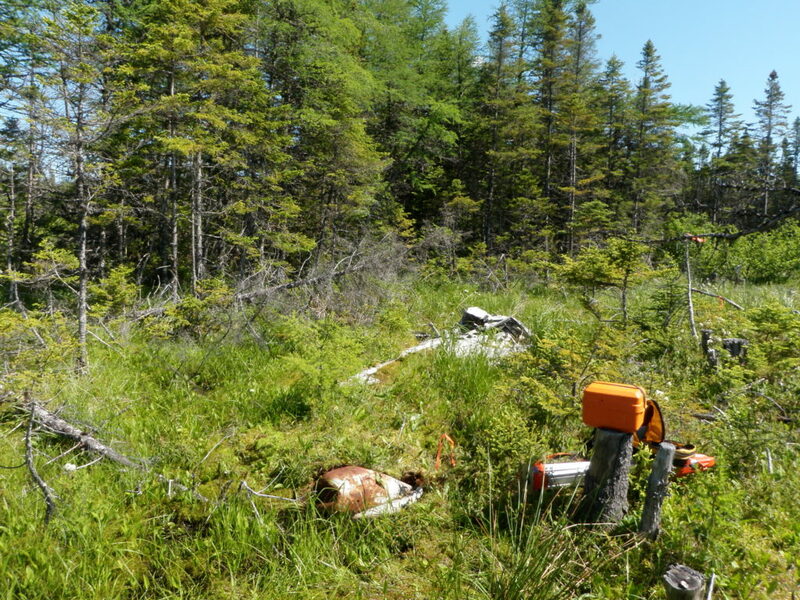 From an archaeological perspective, the site offered challenges because unlike the RCAF Lodestar, it wasn’t just on the edge of a bog. It was actually partially in the bog and partially out. In fact, the wet area seemed more like it was a relatively new wet area as it might have been an expansion of the bog after the area had been logged. 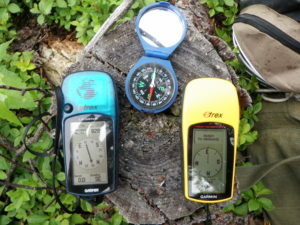 The pieces scattered around the open area could be easily measured, both by a Garmin GPS or by the surveryor’s level. However, I opted to not use the surveyor’s level because what was in the trees could not be measured that way. Debris was scattered throughout the tightly packed grove of trees, and sometimes larger pieces could not be properly photographed because other trees were in the way. 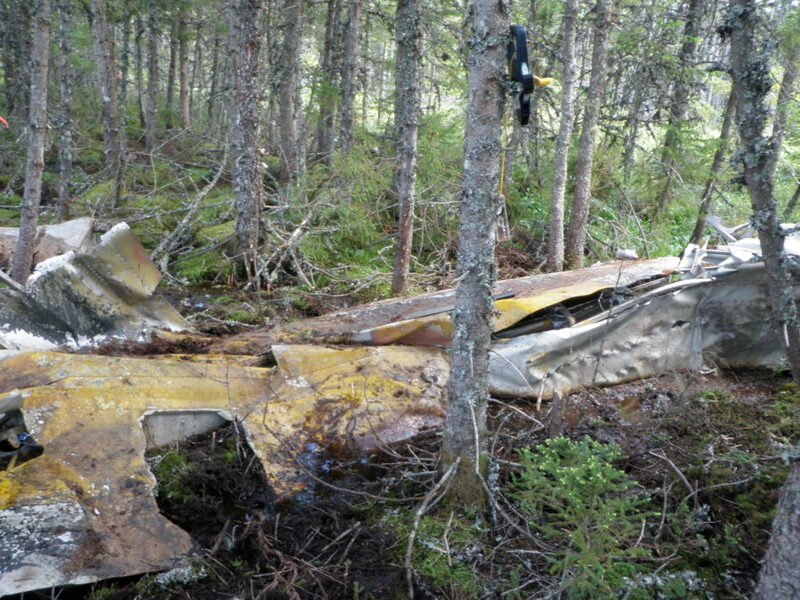 A segment of fuselage that could not be properly photographed due to the trees. Photo by Lisa M. Daly 2011. The site itself was well recovered, most likely at the time of the crash. There were no propellers, instruments or other sensitive equipment on site. 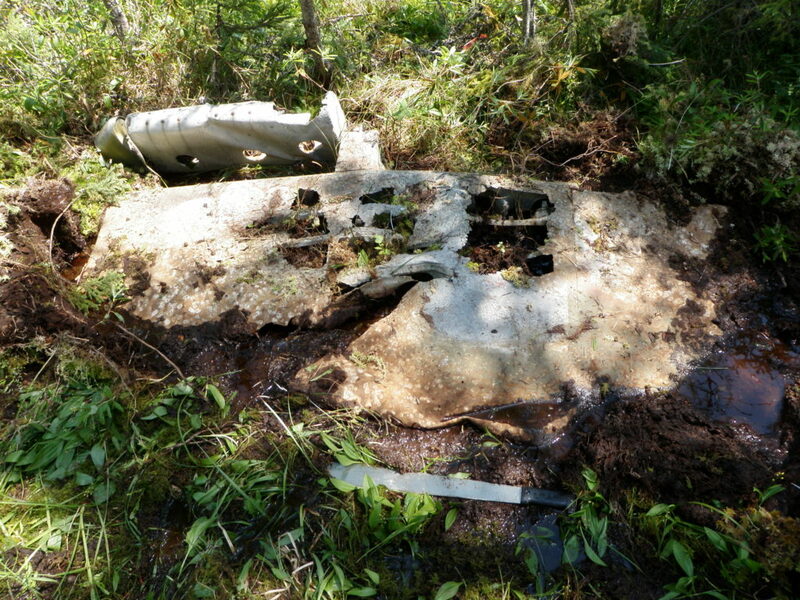 Most of what could be found were aluminum fragments of the fuselage and some pieces of the frame. 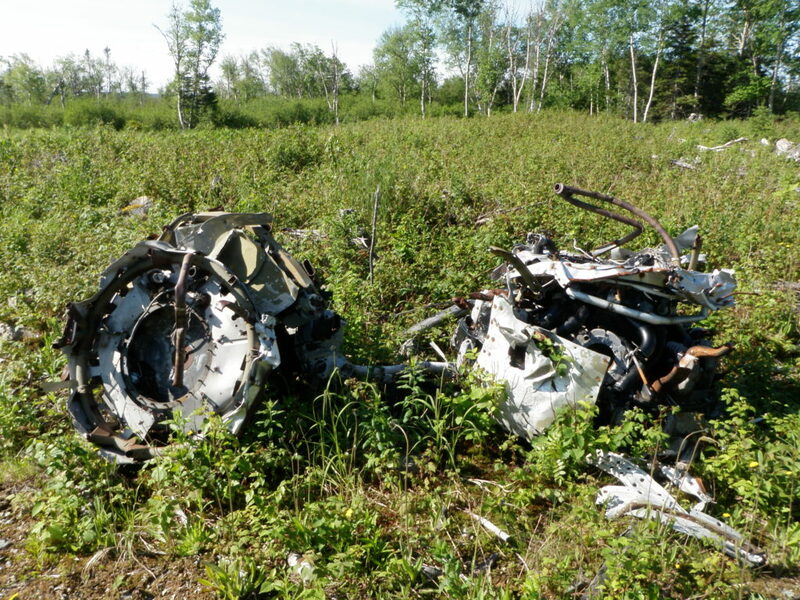 The engines had been left on site, but were recovered by 9 Wing Gander a few years previous and laid closer to the road leading to Deadman’s Pond. According to Frank Tibbo (pers. comm. 2011), there were to be (or will be) used by the North Atlantic Aviation Museum. Engines found near the road to Deadman’s Pond. Photo by Lisa M. Daly 2011. Given that in looking around the site there was no evidence of an entry point of the aircraft, and that much of the debris in the trees did little damage to said trees, it is highly likely that there was a mid-air explosion which scattered the aircraft around the site. 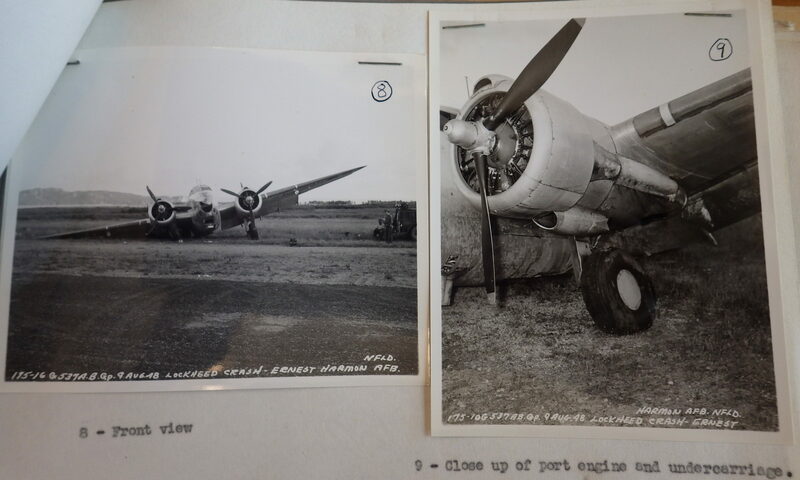 There is no evidence of burning, like at the USAAF B-17 44-6344, and no birch trees which would grow first after a fire, as seen at the RCAF Canso 98107. There are no real markers of visitation to the site, usually in the form of graffiti or litter, but I have talked to people who have been at the site, and who claimed to have removed things from the site (although their story changed and I cannot confirm exactly from which site they visited and removed material). This section is wrapped around a tree stump, but laid against others, suggesting it may have fallen into the trees. Photo by Lisa M. Daly 2011. This site offered many challenges, but hopefully if I could ever have access to the personnel records there would be more information and it could give a better idea as to what happened in this incident. 2007 Mount Pleasant Cemetery – St. John’s: Field of Honour. 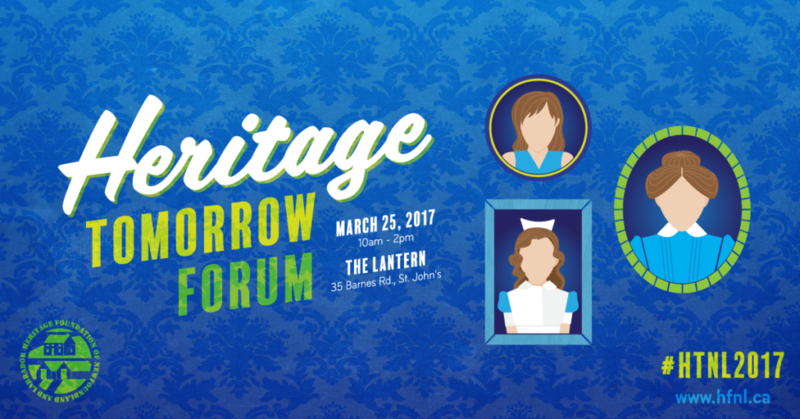 (accessed 21 Mar 2017). 2014 Thread: 440829 – Unaccounted Airwomen & Airmen – 29-8-1944 (accessed 21 Mar 2017). 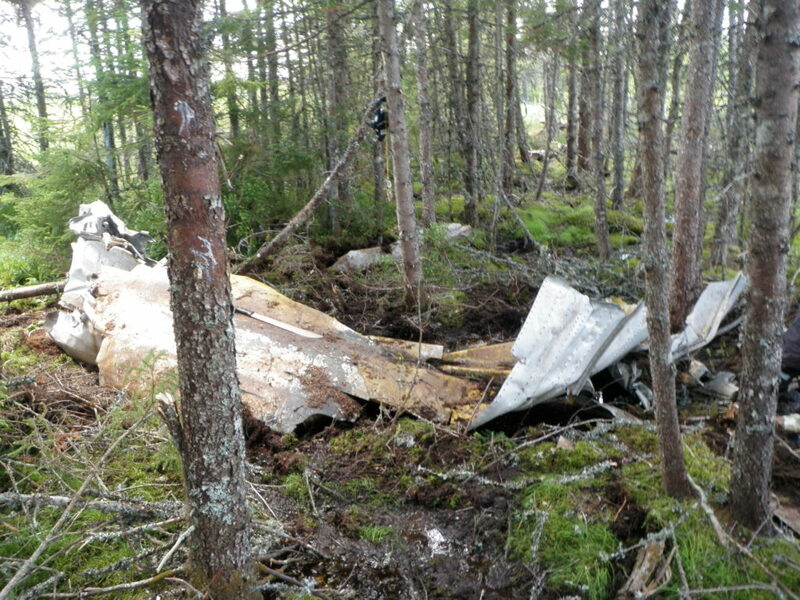 2011 Thread: Ferry Command Crash Sites in Gander, Newfoundland. (accessed 20 Mar 2017). 1997 The Best of Aviation: 101 Tales of Fliers and Flying as Published in The Gander Beacon. Creative Book Publishing, St. John’s. Debris from the wreck of RAF B-25 KJ584. Photo by Lisa M. Daly 2011.